Its a wonderful incident to share on a Friendship Day! It was an evening of mid June, and a Kid’s Gang living in Naranpura area of Ahmedabad city was playing at a lonely place nearby their residence. The game was Hide and Seek and it was Swayam’s turn in the game so he closed his eyes and started counting one, two, three … and the other kids Parshwa, Vishvesh, Param, Devansh, Devam & Rishabh started looking for the place to hide. After a bit of time almost all have found their hiding place, but Devam was still finding the right one. In the mean time suddenly he fell down. Everyone was hidden so no one noticed him instead the youngest one of the Kid’s Gang Param. The Tale of Grit is - this 4 year old Param started crying like anything. His loud cry made all other kid’s to come out and he showed the place where Devam was fallen down. And this made all the kids so curious and dynamic. They thought Devam has fallen down in a Drainage line. The Tale of Grit is - they all together instantly took the action like they have to accomplish a mission. Parshwa ran towards the society and started calling the people for help. Somehow Rishabh makes out that he should inform Devam’s mother first and he ran and informed her that Devam has fallen down in a Drainage line. The other three Vishvesh, Swayam and Devansh ran towards the place where actually Devam has fallen down. They found out that it was not a Drainage line, but an underground tank of water. Somehow Devam has fallen down inside with the lid of the water tank. 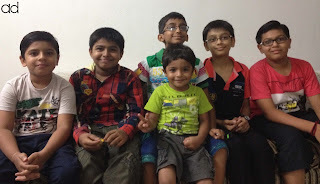 “To keep calm is the tale of Grit.” Devam in such situation could keep calm and his friends Vishvesh, Swayam and Devansh encouraged him to come out with the help of the pipelines. They guided Devam the path to come out and the brave heart Devam somehow could manage to come up using pipelines of the tank. Till the time Parshwa was back informing the society members and Param was still crying for Devam. All the Kid’s Gang together gave a helping hand to Devam and pulled him out of the water tank. By the time the society members and Devam’s mother reach the place, Devam was out of the danger because of his own and his Gang’s brave and intellectual act!! Later on all of them were pampered with an ice-cream party. I have always believed that - “Childhood is the most natural, loving and the FEARLESS phase of the life.” And through this incident this Kid’s Gang has proved it right. Two of them complained to their mothers of having pain in the arm for 3 days after the incident occurred. But still all of them shared with me that they will continue giving a helping hand to the ones in need. In the future they want to become an Astronaut, an Artist or may join the Army to help the world. When I met this Kid’s Gang, it was play time for them. And the Tale of Grit is - they were more interested in their play rather than sharing their story & being noticed by the world. It was 12 feet deep underground tank and by the grace of God, it was not fully filled with the water. The lid of the tank was old and rusted so Devam fell down inside with it. The members of the Society took a quick action in changing the lid, but this is an alarm for all of us to frequently check such things. Especially, if it’s a kids play area. I’m thankful to Aasav Shah (father of Devam) for sharing this epic and a round of applause to the brave Kid’s Gang. In photo left to right – Vishvesh Shukla (class 3), Devam Shah (class 4), Parshwa Shah (class 7), Swayam Shah (class 7), Devansh Shah (class 7) and (in front) Param Shukla (JrKg). I missed the chance to meet Rishabh Shah (class 5). Very nice., and prode to my Student vishwesh. Thanks for reading and comment Ashish Sir. I humbly request you to please encourage all your students to help the other with their real needs always. A teacher can create Miracles. Thanks once again.